The authors set out and comment on a number of different collaborative designs that are intended as structures and strategies to improve collaboration among educators in ways that enhance equity and excellence in student learning. 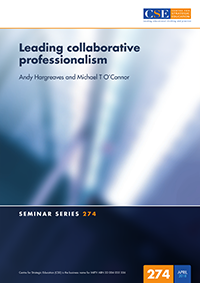 They provide brief portraits of three international designs – a teacher-led professional learning community, a collaborative planning network, and a particular kind of lesson study – then draw conclusions about how they represent more robust forms of collaborative professionalism rather than mere professional collaboration. They conclude with a number of recommendations for school leaders in particular.